The battle of San Jacinto changed the world as we know it. It brought about the realization of Texas Independence and led to the creation of the Republic of Texas. While this battle was a Texian victory, both sides mourned the loss of General Manuel Fernandez Castrillon for the professionalism and humanity he had demonstrated during the Texas campaign. Following the battle of the Alamo, several witnesses reported that General Castrillon brought forward a group of captured Alamo defenders under his protection, hoping to spare their lives as prisoners of war. Santa Anna, however, ordered their immediate execution, causing Castrillon to walk away in disgust. General Castrillon was seen rallying his troops at the battle of San Jacinto against Sam Houston’s army. In his final moments, Castrillon stood defiantly with his arms crossed, refusing to retreat from his enemy. Following his death, he was buried with full honors in the family cemetery of Lorenzo de Zavala, the Vice President of the Republic of Texas. This small artifact, a shaving kit belonging to General Castrillon, was found by the Texians soldiers and given to Texian Colonel Thomas Rusk as a sign of respect. 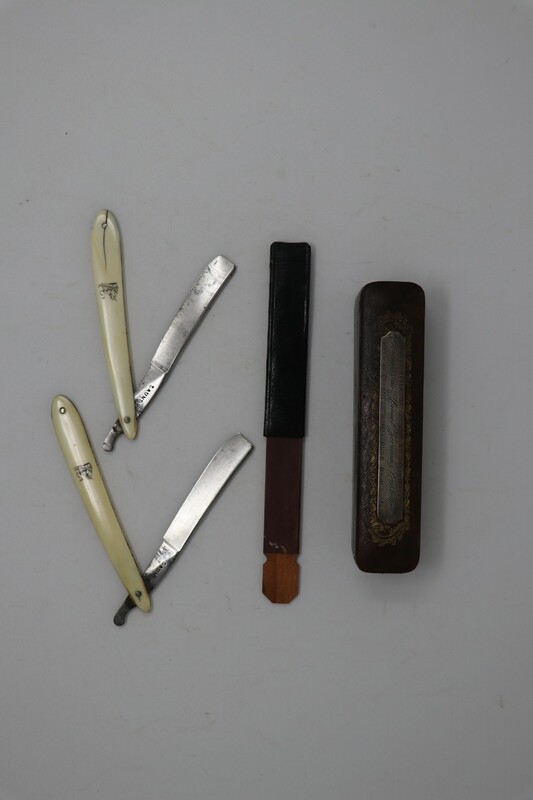 The kit includes two razors and a small sharpening strop. The silver escutcheon on top of his case bears Castrillon’s name.